Ayden was feeling even better today. He has a tiny cough but other than that he is as good as new. It was amazing how much I was able to get done! Since he was so great about "doing his own work while Mommy did her's" (that's what I tell him when I need him to play independently), I set up an extra special bath for him. He had so much fun! I got the idea from Pinterest I think, though I couldn't find an actual pin to link you to... I must have just seen it and had a note to self moment. It was fun to spice things up a bit for him. I think he also liked his bath because we have a really nice heater set up in there and I turned it on an hour before bathtime. I was nice and toasty in there and felt good on a sub-zero morning. We tried something new as a family this evening. David met us at a grocery store near our gym where we had salads from the salad bar before heading over for a workout. Ayden waltzes into the child care like he's an old pro these days which allows us to really clear our heads while we exercise. He's also at a special advantage since he is potty trained at such a young age. He can choose to go to the toddler side or the potty trained, big kid side. Tonight, he chose the toddler side but when we picked him up they said he went over to the big kid side a little too. Must be nice to have that freedom and I'm glad the staff doesn't seem to mind giving it to him. Before we came home we all went for a swim and Ayden was more than ready for bed by the time we got him there. Is it super cold where you are? What have you been doing to pass the time? We are supposed to be getting more snow this weekend. Hopefully Ayden's birthday party on Sunday doesn't get snowed out! Flashback! Here's what we were up to one year ago today: "Anytime, Anywhere"
I hope you dont mind me asking, but are you affiliated with any religion. I am an LDS mormon and I belong to the church of jesus christ of later day saints. You probably have seen mormon missionaries before or beautiful temples all over. That is our church. If you are interested, I would love to aquaint you with some missionaries who can give you lessons. My own mother joined the church because of missionaries who knocked on her door. She is an active member today. You do not need to reply to this message if you are not intetested, but if you are, I can give you more info. We have been using Crayola Window Markers to make creations on our front windows. I also have been doing a lot of painting and building lego towers with Nancy. 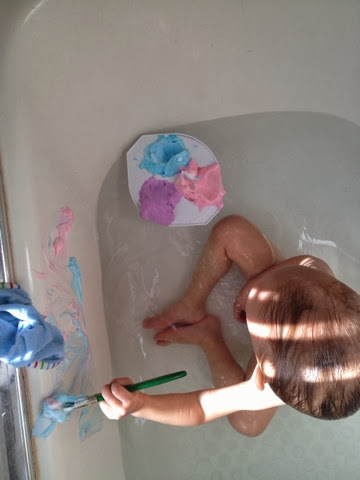 I love your idea of painting in the bathtub.